Jordan Pickens, Master of Harrisonville Masonic Lodge #411 and Jess N. Raines, Grand Master of Masons of the State of Ohio. Harrisonville Masonic Lodge No. 411 in Harrisonville, Ohio will have its annual inspection in the second degree on Friday, Feb. 8, 2019 at 7 p.m. Dinner will be served at 6 p.m. by Harrisonville Chapter Order of The Eastern Star #255. Harrisonville Masonic Lodge No. 411 is part of the 12th Masonic District, which includes 18 lodges in Meigs, Jackson, Gallia and Lawrence counties. Harrisonville Masonic Lodge #411 has 114 members and is involved in various ways within the community. 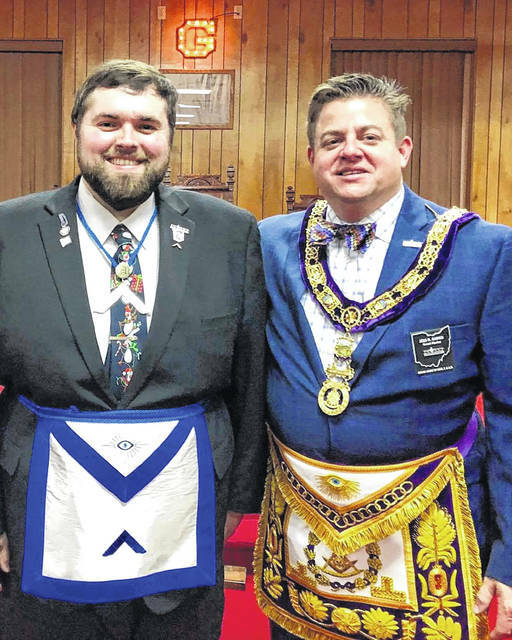 Steven E. Wallis, District Deputy Grand Master of the 12th Masonic District will inspect the Lodge as the personal representative of Jess N. Raines, who is the Grand Master of the nearly 500 Masonic Lodges in Ohio with a total statewide-membership of around 75,000. The Grand Lodge of Ohio was formed at the Old Statehouse in Chillicothe on January 3, 4, 7 and 8, 1808. Freemasonry is the leading fraternal organization in the world. Its origins are lost in the unrecorded history of medieval times, but it formally organized in London, England, in 1717. Current worldwide membership totals over 3 million members, 1.1 million of whom are in North America. With 75,000 Masons and 450 local Lodges, Ohio has one of the largest Masonic memberships of any state in the country. As a fraternal organization, Freemasonry unites men of good character who, though of different religious, ethnic or social backgrounds, share a belief in the fatherhood of God and the brotherhood of mankind. For more information, call Jordan Pickens at (740) 992-1384 or visit www.freemason.com.